This car millions people on all planet and here waited, at last, on a showroom in Geneva has been presented new Lamborghini Aventador. One of the most powerful on the earth of engines V12 at work liberates 700 horsepower’s. As it is necessary to note new amazing design of the car which does not leave anybody indifferent. Yes, all is new and long-awaited Lamborghini Aventador LP700-4! Lamborghini really very well transfers style of an ominous super sports car, but you should know that the name “Aventador” is made far not up. According to the company, “Aventador” is a name of a bull which participated in 1993 in fight on arena Zaragoza and earned an award “Trofeo de la Peña La Madroñera” for outstanding courage. It is not necessary to be the genius to understand that new Aventador LP700-4 all uses the same design, as latest models of the company of Lamborghini, such as Reventon and Sesto Elemento. The design such has been developed in Centro Stile Lamborghini in Sant the Bolognese and has been borrowed at the fastest and quick planes in the world. The car has length of 4.78 meters, width of 2.26 meters and only 1.136 meters in height. Case proportions have been picked specially up that as it is possible to improve aerodynamics of the car more carefully. All aerodynamic elements, from a front weather-cloth to a rear louver, are integrated into the framework form. The case as it is possible to notice, is made at a small angle that too plays not a few-important role on the big speeds, helping the car to keep stability and stability. In front at Aventador settled down huge aero dynamic lattices which are framed by a black glossy framework, and hardly are above located bi-xenon headlights. But these headlights – not simply bulbs, in the case, it is a design integral part. They have the form in the form of an English letter “Y” and consist of the basic xenon fires and the light-emitting diode bulbs playing a role turn lights. At Aventador LP700-4 there are two basic lines of the design, the first underlines a front arch of a wheel, and the second represents sharply delayed line which is beginning from face-to-face wheels and coming to an end in the rear of the car. As it is necessary to note two big air intakes behind lateral doors which provide reliable cooling of the engine. Well and at last it is possible to pass to the rear of the car which in appearance turned out a little flat, but believe, it at all does not spoil a kind of the car, and on the contrary, does its more unusual and impudent. In the best traditions of the company of Lamborghini, both passenger doors will open vertically upwards. This “counter” was used in all basic models of Lamborghini, since model Countach. In the world there is rather limited quantity of automobile companies which could keep this technology within several decades. The nearest competitors in this question are Mercedes-Benz 300SL and SLS AMG. Clients, at the car order, can choose one of 13 colors of a body, here their names: Grigio Estoque, Arancio Argos, AD, Nero Nemesis, Bianco Canopus and Marrone Apus. Are available as matte shades which as well as possible approach for a sports car of such class. If you are one of lucky beggars who sat in Lamborghini Reventon cabin you should be known that Lamborghini company tried to create the internal interior consisting entirely from a continuous meter panel. The same style removed in Aventador. As to innovations designers tried wonderfully well, making a cabin of Aventador very similar to a cabin of the jet plane; it basically is shown in instrument gauges, a speedometer and a tachometer. As at the car is present LCD the screen from which you can steer your radio tape recorder and navigating system. Skin color which all passenger compartment is fitted, it is possible to choose at the order. There are two primary colors Nero Alde (black) and Marrone Elpis with a contrast line. Aventador will be offered with ABS, system of the electronic distributed braking, traction control and, certainly, function EPS (Electronic control of stability). The rear spoiler and lateral air intakes have an electronic control system. Revolutionary system Drive Select allows the driver to adjust individual parameters of the engine, a gear box, differential and a steering in one of three modes: Strada (road), Sport and Corsa (track). 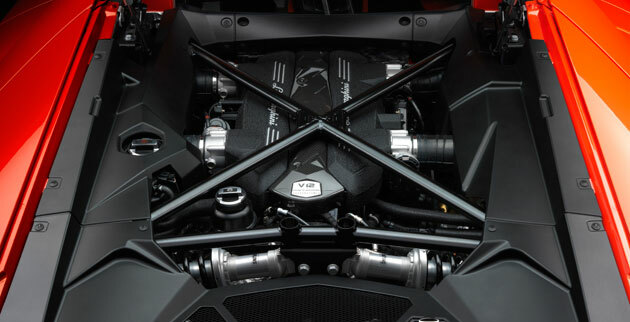 Lamborghini company clearly let know that engine V12 will be the basic symbol of all sports cars of the company, but time goes and it is necessary if not to change then to improve available operating time. Aventador it will be delivered with new 6.5-litre all-wheel drive engine V12 which grants to the car of the whole 700 horsepower’s at 8250 turns in a minute and 509 Nm at 5500 RPM. It is the first, absolutely new engine since car Countach. This cursor is capable to disperse the car from 0 to 100 for any pity 2.9 seconds and to provide the maximum speed equal of 350 km/h (230 mph). If to consider that weight of the car of 1575 kg it is possible to calculate a capacity parity to weight, and it will be equal 2.25 kg/h.p. Agree, these figures amaze imagination. The new engine became much easier and more powerful than the predecessor. It managed to achieve thanks to an aluminum-silicon alloy. As a result the engine began to weigh 235 kg. The new seven-step automated mechanical gear box with manual switching which provides lightning start of the car did not pump up also. One more feature of new gear box ISR is the simultaneous gear shift. It works as follows: when one rod moves from one gear box, the second rod is already switched to the following. Its weight, only 79 kg became One more prominent aspect of new transmission, it is much easier than all other gear boxes DSG in the market. The majority of details of new Lamborghini consist of a carbon fiber. At use of this material, it is possible to create structure which will be much stronger and easier than a steel. Until recently this material was used very seldom and was a prerogative of the company of Ferrari, but time runs and already now new Lamborghini Reventon consists from this material from a roof to the bottom. The cabin gross weight in which you will sit at driving, will make 148 kg. The body and the chassis will be made completely from carbon-plastic. Thanks to cooperation with company Boeing and the Washington university, the special kind of the plastic which ruggedness pays off as 35000 Nm of a deflection has been developed for comparison, at Koenigsegg CCR this parameter is equal 28100 Nm, at Ferrari F50 – 34600 Nm, and at Lamborghini Murcielago – 20000 Nm. 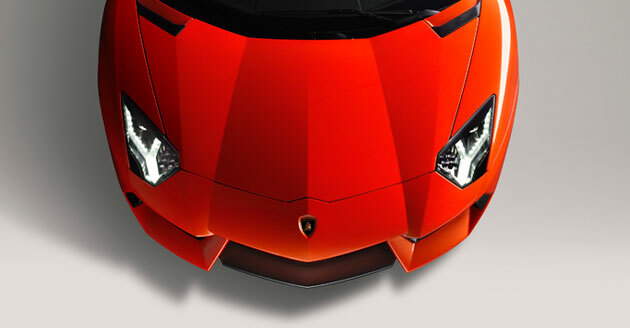 New Lamborghini Aventador LP700-4 goes on sale in the end of summer of 2011 at the price $387 000. The company informed that is planned to exhaust only 4000 cars that on 99 units more than at Murcielago.